EDGE being a company focused on technology, it gives great pleasure for us to contibute in the sponsorship of events of this nature in Romania. Multirotor competitions are a sport of the future, and combine perfectly technology with the capabilities of the pilots coordinating these high speed drones. This competition is being organized in the Liberty Technology Park garden in Cluj-Napoca, on the 26th and 27th of August 2017, giving free access to both participants and spectators alike. Drone racing is becoming more and more popular, and the motive why we chose to participate in the organization of such an event is due to the fact that in the construction of these flying machines there is both a hardware and a software aspect. It's good to know that most of the pilots that participate in these kind of competitions chose to build their own multirotors to be able to fully customize the flying characteristics. This customization happens both at the motors, motor controllers and even at the "brains" of these machines which are actually based on microcontrollers, after which further perfecting is done at software level by calibrating the PID values that make up the basis of the echilibration algorithms used. 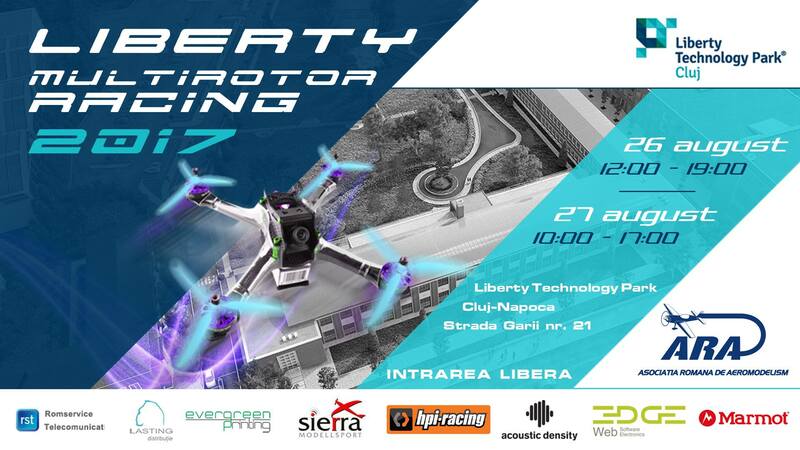 But without going into too many technical details, we look forward to seeing you at this event organized by ARA (The Romanian Model Flying Association) in the Liberty Technology Park in Cluj-Napoca!